When locking or unlocking the doors The system can be operated when the electronic key is within about 2.3 ft.
(0.7 m) of an outside door handle. 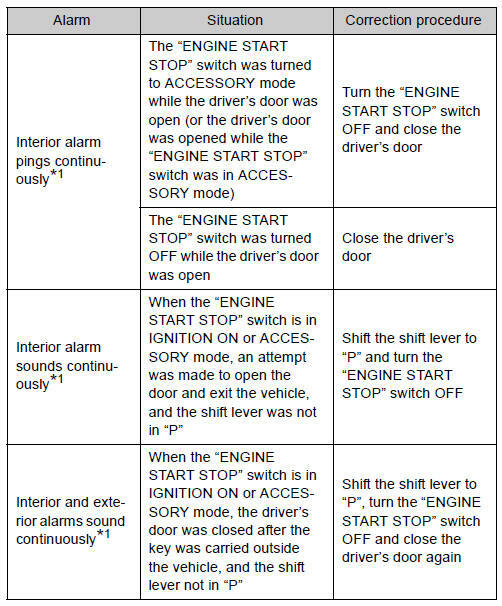 When starting the engine or changing “ENGINE START STOP” switch modes The system can be operated when the electronic key is inside the vehicle. If the door will not lock even when the topside sensor area is touched, try touching both the topside and underside sensor areas at the same time. It is possible to set which doors the entry function unlocks. The setting changes each time an operation is performed, as shown below. again and the alarm will automatically be set.) In case that the alarm is triggered, immediately stop the alarm. 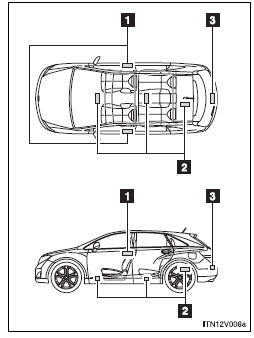 In the following circumstances, the entry function is disabled in order to prevent the vehicle and electronic key batteries from discharging. 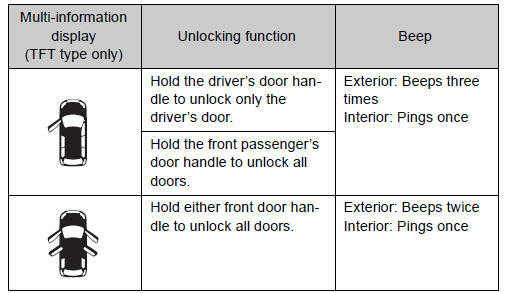 • The vehicle is locked using the door handle lock switch. • The vehicle is locked/unlocked using the wireless remote control function or the mechanical key. • The standard battery life is 1 to 2 years. (The battery becomes depleted even if the electronic key is not used.) If the smart key system or the wireless remote control function does not operate, or the detection area becomes smaller, the battery may be depleted. Replace the battery when necessary. • If the battery becomes low, an alarm will sound in the cabin when the engine stops. • To avoid serious deterioration, do not leave the electronic key within 3 ft.
(1 m) of the following electrical appliances that produce a magnetic field. Make sure to carry the electronic key when operating the system. 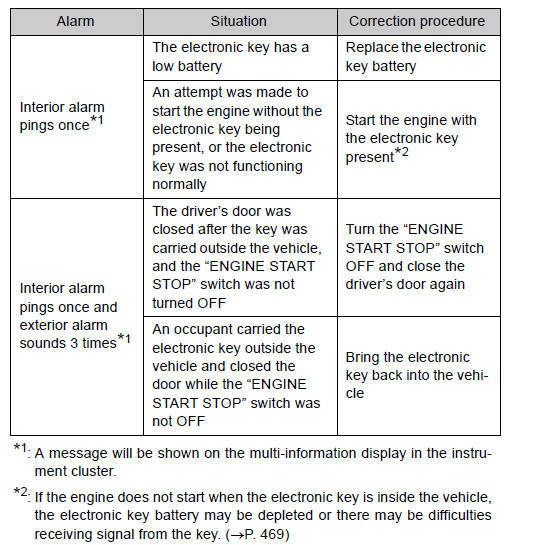 Do not get the electronic key too close to the vehicle when operating the system from outside of the vehicle. Depending on the position and holding condition of the electronic key, the key may not be detected correctly and the system may not operate properly. • Even when the electronic key is within the effective range (detection areas), the system may not operate properly in the following cases. • The electronic key is too close to the window or outside door handle, near the ground, or in a high place when the doors are locked or unlocked. • The electronic key is near the ground or in a high place, or too close to the rear bumper center when the back door is locked or unlocked. • The electronic key is on the instrument panel, floor or in the glove box when the engine is started or “ENGINE START STOP” switch modes are changed. • Do not leave the electronic key on top of the instrument panel or near the door pockets when exiting the vehicle. Depending on the radio wave reception conditions, it may be detected by the antenna outside the cabin and the door will become lockable from the outside, possibly trapping the electronic key inside the vehicle. • As long as the electronic key is within the effective range, the doors may be locked or unlocked by anyone. • Even if the electronic key is not inside the vehicle, it may be possible to start the engine if the electronic key is near the window. • If the key is kept near the vehicle while it is being washed, water applied to a door handle may cause the door to lock and unlock repeatedly. In this event, place the key in a location 6 ft. (2 m) or more from the vehicle, taking care not to lose the key. • If the key is inside the vehicle while it is being washed, water applied to a door handle may cause a buzzer to sound. In this event, locking all doors will cause the buzzer to stop sounding. • It may not be possible to lock the doors if the sensor area is covered by mud, ice, snow etc. In this event, try locking again after cleaning the area, or lock by touching the sensor area on the underside of the door handle. • Gripping the door handle when wearing a glove may not unlock or lock the door. • A sudden approach to the effective range or door handle operation may prevent the doors from being unlocked. In this case, return the door handle to the original position and check that the doors unlock before pulling the door handle. 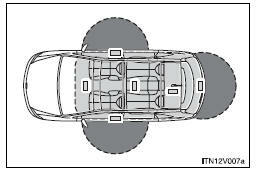 To prevent theft of the vehicle, do not leave the electronic key within 6 ft. (2 m) of the vehicle. If a door is not opened within approximately 60 seconds after the vehicle is unlocked, the security feature automatically locks the vehicle again. A combination of exterior and interior alarms as well as warnings displayed on the multi-information display are used to prevent theft of the vehicle and unforeseeable accidents resulting from erroneous operation. 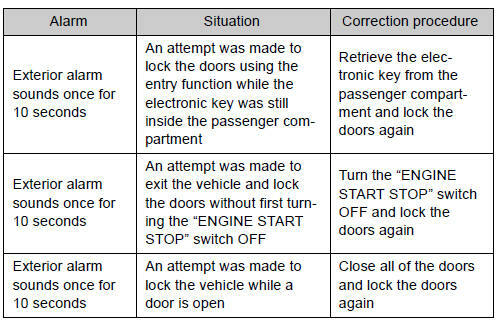 Perform the appropriate correction procedure described in the following table. Settings (e.g. smart key system) can be changed. ► For vehicles sold in the U.S.A.
• People with implanted pacemakers or cardiac defibrillators should keep away from the smart key system antennas. The radio waves may affect the operation of such devices. If necessary, the entry function can be disabled. Ask your Toyota dealer for details, such as the frequency of radio waves and timing of emitting the radio waves. Then, consult your doctor to see if you should disable the entry function. • Users of any electrical medical device other than implanted pacemakers and implanted cardiac defibrillators should consult the manufacturer of the device for information about its operation under the influence of radio waves. Radio waves could have unexpected effects on the operation of such medical devices. Ask your Toyota dealer for details for disabling the smart key system. The wireless remote control can be used to lock and unlock the vehicle from outside the vehicle. 2. Unlocks all doors Pressing the button unlocks the driver’s door. Pressing the button again within 3 seconds unlocks the other doors. 3. Unlocks all doors Pressing the button unlocks the driver’s door. Pressing the button again within 3 seconds unlocks the other doors. Twice) Back door: A buzzer sounds and the emergency flashers flash twice to indicate that the back door has been opened/closed. If a door or back door is not fully closed, a buzzer sounds continuously for 10 seconds if an attempt to lock the door is made. Fully close the door to stop the buzzer, and lock the vehicle once more. Using the wireless remote control to lock the door will set the alarm system. The standard battery life is 1 to 2 years. (The battery becomes depleted even if the key is not used.) If the wireless remote control function does not operate, the battery may be depleted. Replace the battery when necessary. ►Vehicles with smart key system Locking and unlocking the doors: Use the mechanical key. ► Vehicles without smart key system Locking and unlocking the doors: Use the key. ►Vehicles without smart key system The wireless remote control function may not operate normally in the following situations. Settings (e.g. 2-step unlocking function) can be changed. Pressing the wireless remote control switch again while the power back door is operating will cause the operation to reverse. However, the reverse operation cannot be performed for the first second after automatic operation starts, even if the wireless remote control switch is pressed again.